Labour productivity measures the output per worker in a period of time. A reduction in costs. A firm can produce the same quantity with fewer workers, leading to lower average costs. This can lead to lower prices or at least keep prices low. 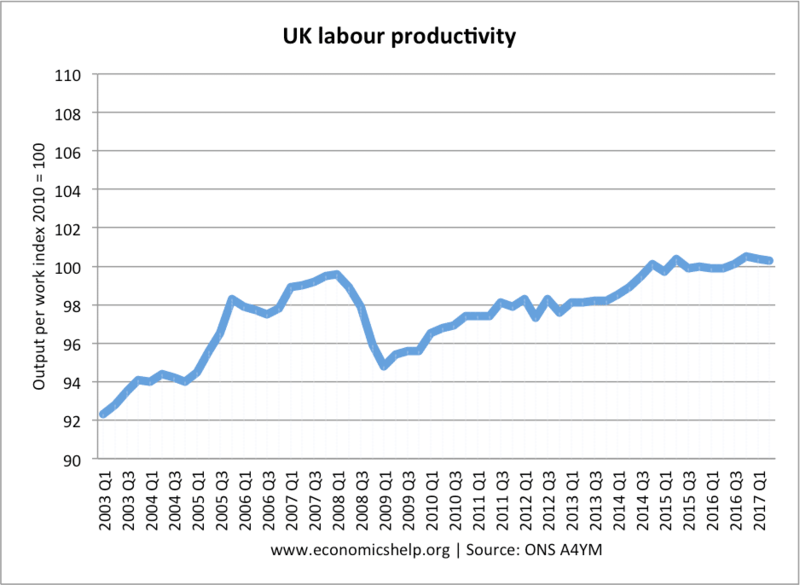 Labour productivity in the UK. From 2003 Q1 to 2008 Q1 the index of labour productivity rose from 92 to just under 100. A rise of 8.6%. Increasing productivity is only part of the equation. There must be demand for the product. Increasing labour productivity might require expensive investment in capital. The cost savings from higher productivity need to be higher than the capital investment. If real wages rise, it becomes more important to increase labour productivity.